Large OEM blowers and inline OEM fan blowers engineering sales. Designers of heavy duty industrial pressure blowers and inline dust collecting fans, combustion pressure blowers, pneumatic conveying blowers, ventilation system fans, heavy-duty radial blowers, force air inline fans. Sales of roof and wall ventilators and roof exhaust ventilators / inline fans. Buffalo Blower custom built fans, ventilators, high temperature plug fans, combustion air blowers, Buffalo Blower oven circulation fans. 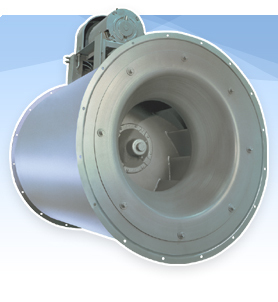 Combines the reliable performance of the squirrel cage type centrifugal fans with the compactness of axial flow fans. Inline centrifugal fans are used in many types of ventilation systems where the use of conventional scroll type centrifugal fans is impractical. The tubular centrifugal fan models are compact and are easily connected to the ductwork. The square inline fan models, even though are a bit larger than the tubular models, offer the ease in maintenance access with their removable panels. Home | Site Map All Rights Reserved. Oleg Systems Ltd. Copyright © 2001-2013, Canada..
Engineering sales of air knife blowers, blow off fans, stainless steel fans and SST blowers, spark resistant ventilators, combustion blowers, vane axial / tube axial blowers, high pressure ventilators, sealed blowers and fans, FRP fiberglass ventilators. Canada Blower BCF composite fan is a backward curved industrial fan designed for handling particulate-free, corrosive or caustic air in high pressure applications where conventional steel and stainless steel fans would corrode. All of the parts that are exposed to the airstream are constructed of high-quality corrosion resistant materials to avoid material breakdown from most chemicals. The BCF blower features a wide wheel and housing, producing a high volume of air at a lower velocity ventilating.com fanblower.com highpressureblower.net industrialblowerfan.com industrialfanblower.net industrialfanblower.com pressureblower.net northernindustrialsupplycompany.com industrialpressureblower.com tenderall.com chicagoblowercanada.com cbblower.com buffaloblower.com buffalofan.com nis-co.com canadianblower.com olegsystems.com canadablower.com abbblower.com acmefan.net industrialblower.net fansandblowers.net americanblower.net barryfan.com cincinnatifan.net canadafans.com barryfan.net pennbarry.net pennfan.net tcffan.com. Canada Blower is a backward curved industrial fan designed for handling particulate free, corrosive or caustic air in high pressure blower applications where conventional steel and stainless steel fans are not suitable. Model BCF fan features a wide wheel and housing, producing a high volume of air at a lower velocity, therefore the need for an expansion evasé is eliminated. Model BCF blower is designed so all fan parts exposed to the airstream are constructed of high-quality corrosion resistant materials avoiding material breakdown from most chemicals.